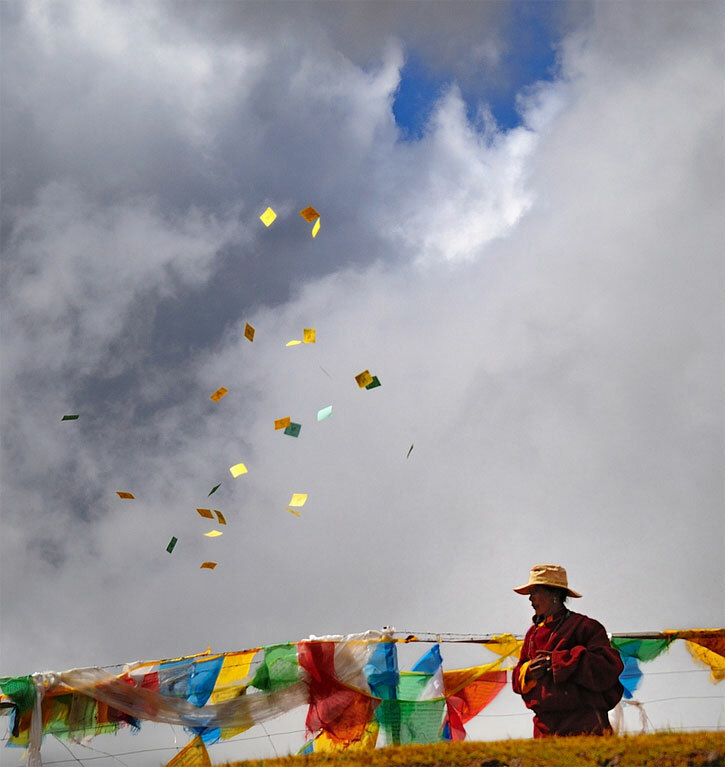 The prayer flags in this image are wind horses; they are called རླུང་རྟ་ — or lungta. They serve as an allegory for the human soul, and now ritually used as a symbol of well-being and good fortune in Tibet. 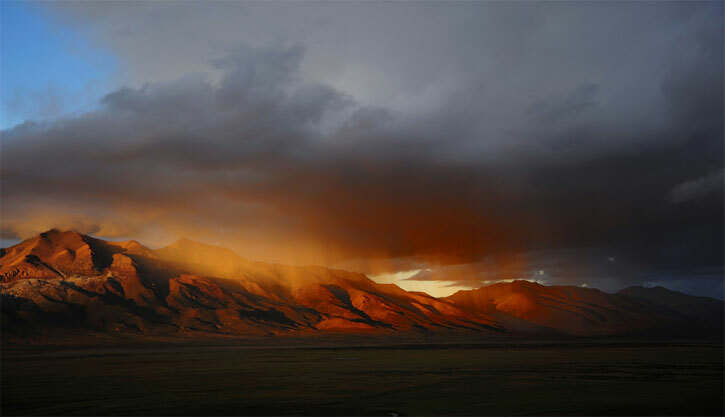 The mountain range of Mount Ti Se (གངས་ཏེ་སེའི་རི་རྒྱུད or gangs te se’i ri rgyud/ gangté serigyü). 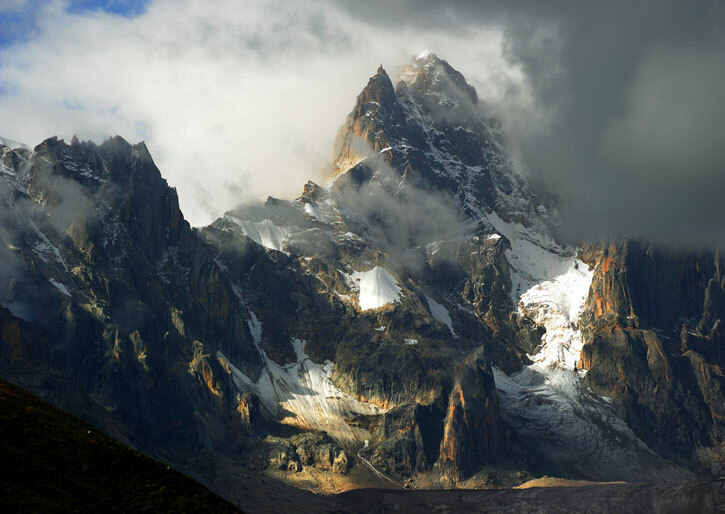 Also called the Kailash Mountain Range. Your images are often landscape shots or portraits of people, which, in themselves, do not carry much political weight. Yet a lot of your descriptions on Flickr are matched up with news stories of a somewhat political or historical nature. Asides from visual beauty, what are things that you hope to convey with your imagery? For everyone to see and find out the history of Tibet, as in the early days and the present day. I want to show Tibet. I have never experienced [Bad Tibetans]; Tibetans are always open and friendly. 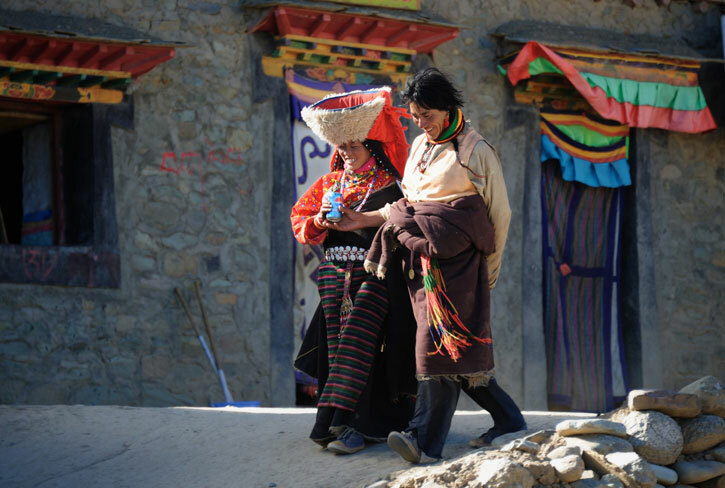 Tibetan culture is disappearing very quickly. I try to capture Tibet mostly for Tibetans in exile everywhere in the world. Once a Tibetan lady who lives in exile, mailed me [and said] she found her brother on several photos (I send her some). How would you say is the general attitude and the spirit of the people in Tibet on a day-to-day basis? How much do relations with China affect them? If Europe were still occupied by the Third Reich, everything would be changed: street names, city names, region names, province names, and even your own country name. This is happening in Tibet; the occupier named this country Xizang. [The name] Xizang is recognized world-wide on maps, magazines, and so forth. By doing this, the [Tibetan] culture and their identity will be lost. 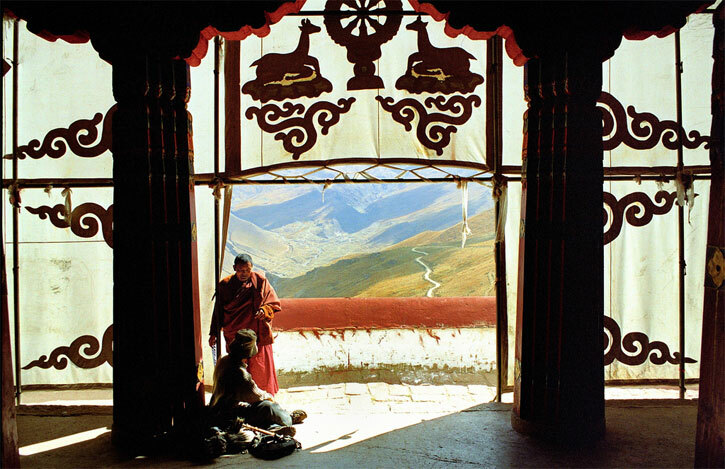 What role do you think color plays in life in Tibet, and has it changed your perception of color? 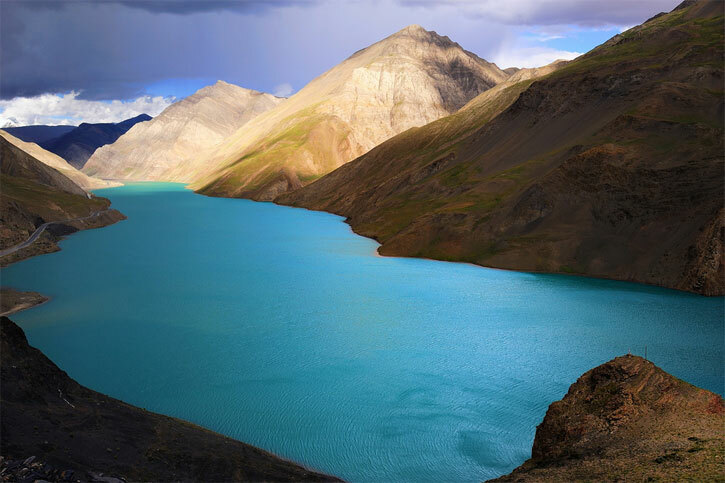 Like many things in Tibet, it is strongly connected with Buddhism, the color Blue symbolizes sky/space, white symbolizes air/wind, red symbolizes fire, green symbolizes water, and yellow symbolizes earth. This is for prayer flags. For me, color is optimistic; it can be bright, it gives depth, and can highlight a picture. I like color like the Tibetans do. What is it that keeps you coming back to this place? As with the landscape, nature and the Tibetans, it is original. There is something in their eyes of peace, openness and friendliness; that is the nature of Tibet. Ganden Monastery — or དགའ་ལྡན་ — is one of the “great three” Gelukpa university monasteries of Tibet, located at the top of Wangbur Mountain. It is the original monastery of the Geluk order, founded by Buddhist teacher Je Tsongkhapa in 1409, and considered to be the seat of Geluk administrative and political power. 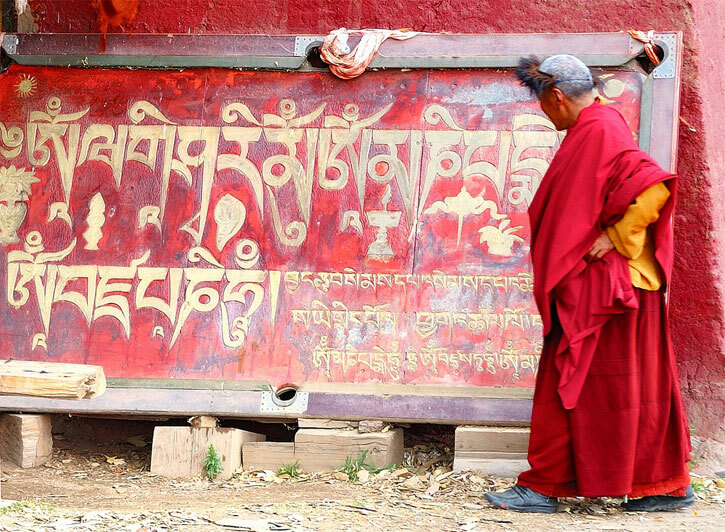 Here, Oṃ maṇi padme hūṃ, the Tibetan sanskrit scripture, is painted on an old pool table.